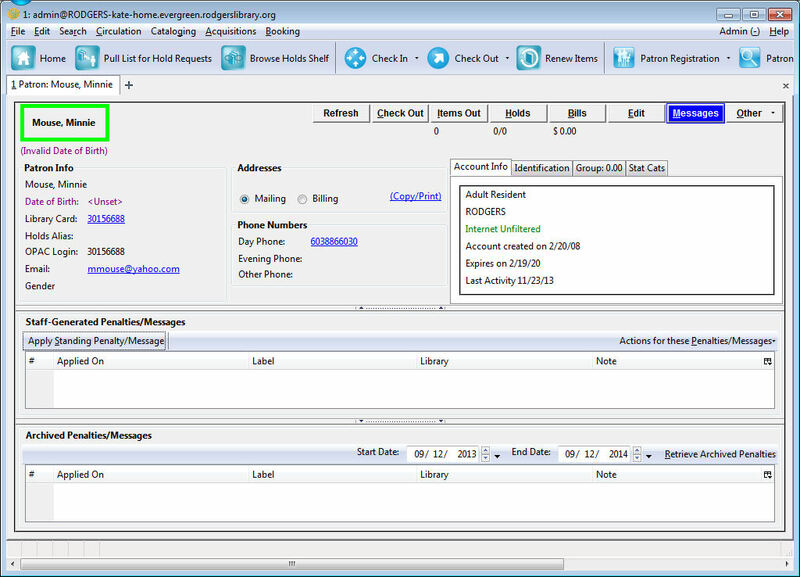 Click Apply Standing Penalty/Message to begin the process of adding a message to the patron. Alert: This will create a non-blocking alert which appears when the patron record is first retrieved. The alert will generate a dark-blue frame around the patron name. Alerts may be viewed by clicking the Messages button on the patron record or by selecting Other → Display Alerts and Messages. 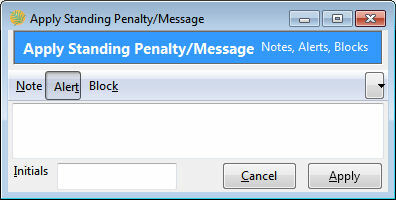 Click to select the message to be modified, then click Actions for these Penalties/Messages → Modify Penalty/Message. This menu can also be accessed by right-clicking in the message area. To change the type of message, click on Note, Alert, Block to select the new type. Edit or add new text in the message body. Enter Staff Initials into the Initials box (may be required.) and click Modify to submit the alterations. Click to select the message to be archived, then click Actions for these Penalties/Messages → Archive Penalty/Message. This menu can also be accessed by right-clicking in the message area. Click to select the message to be removed, then click Actions for these Penalties/Messages → Remove Penalty/Message. This menu can also be accessed by right-clicking in the message area.